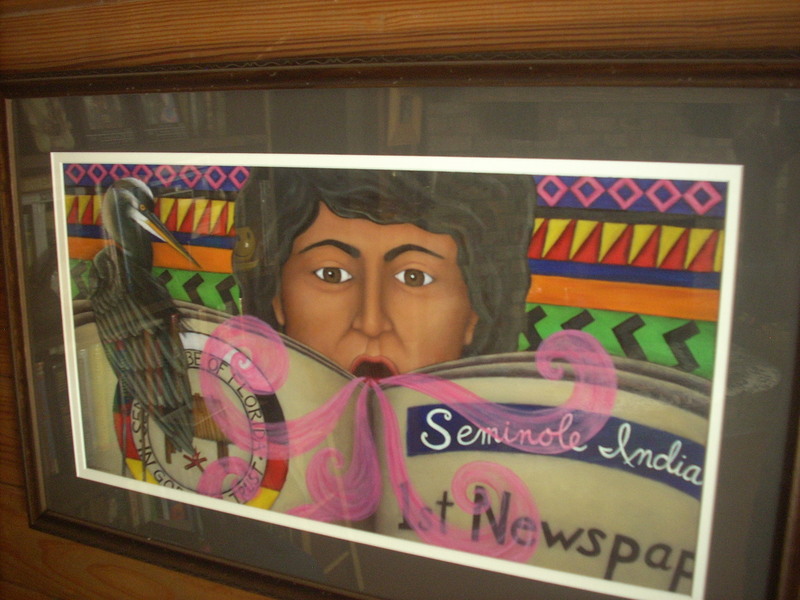 Visit the pages of the Seminole Tribe of Florida for more information about the Tribe & about the Tribe’s first elected woman leader, Betty Mae Tiger Jumper. Bett Mae Tiger Jumper wrestled alligators, survived death threats as a child & returned to her people in South Florida to interpret English into the Creek & Mikasuki languages for them, to lead them & to guide them in improving their health, after receiving her formal education and a nursing degree. She celebrated her birthday circa 1923, on every April 27. Her funeral service in January 2011, after a long & important life, was a lovely & moving ceremony for family & friends that was often conducted in words her two native languages, Creek & Mikasuki. Her grandson preached & her son told great stories. People came from all over the state of Florida & beyond, to honor her Memory; I was fortunate to be there. Years ago on a news writing assignment, I was fortunate to meet Mrs. Jumper. We stayed in touch & I regularly read the Tribe newspaper she edited. I eventually brought our daughter to meet her. I consider it an honor that she authorized me to write her picture book story for children. The book is enriched with a letter to children from poet Moses Jumper, Jr., Mrs. Jumper’s son. ECHOES IN THE WIND, The Seminole Poetry of Moses Jumper, Jr. / Moses Jumper, Jr.
What do you know about The Seminoles & also about Betty Mae Tiger Jumper? Some people have read the legend of The Cherokee Rose. Name a Seminole Indian legend. Yes or No There can only be one true Seminole Tribe. Yes or No Betty Mae Tiger Jumper’s husband fought in the last of the Seminole Wars. Two future U.S. Presidents participated in wars against the Seminoles. Name one or both. 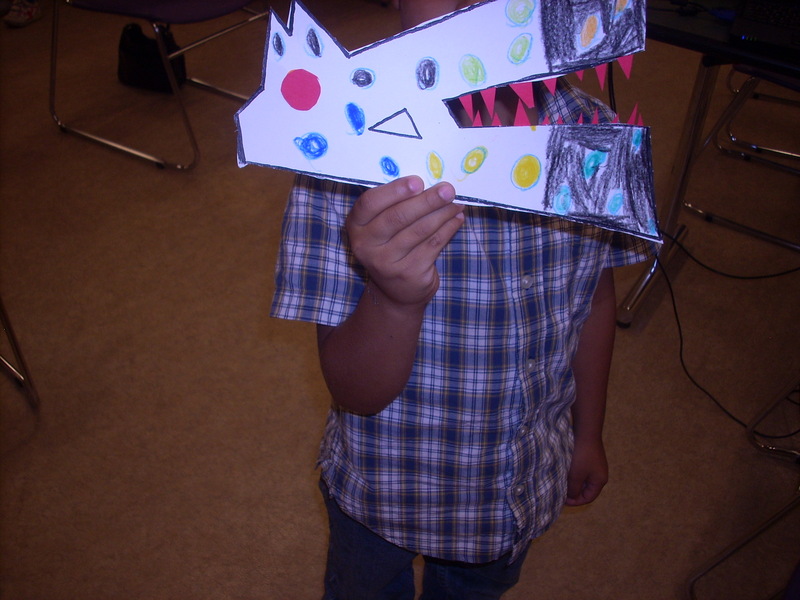 e/Draw an alligator after study of artist Lisa Desimini’s picture, She Sang Promise, p. 22-23. 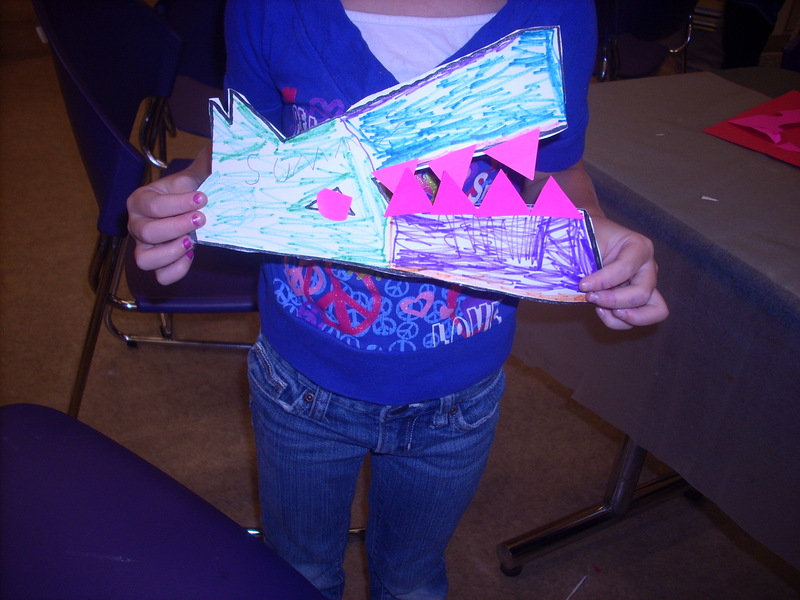 Create a paper bookmark inspired by traditional fabric patchwork clothing. And find diagrams in chapter 4, of Patchwork, Art & Activities of Seminole & Miccosukee Indians of Florida by Dorothy Downs, which can be reproduced for education purposes.Popular Seminole designs have been named rain, fire, & tree. There are multiple others. Decide which symbols of Betty Mae Tiger Jumper’s life to include in your portrait. See the symbols selected by artist Lisa Desimini. (pages 26-27, SSP). Does you portrait include any of the symbols artist Lisa Desimini selected? 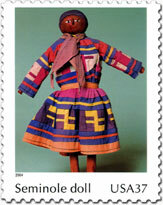 Create a tribute poem/rap about Betty Mae Tiger Jumper, or about the Seminole people. Here are some of Jan’s verses, (copyright Jan Godown, all rights reserved, reproduction permission given for your education purposes, with proper credit). Polka dot, yellow or LIME GREEN !!!! Betty Mae Betty Mae you are cool !!!! SEMINOLE songs of the traditional elders are most often described as ceremonial, infused with sounds that have importance and no particular translation. They are tonal; primarily a sound to achieve an effect. Due to her family’s protection of her from elders singing at the traditional Green Corn Dance, a religious and judicial event, Betty Mae didn’t hear some traditional songs as a child. She heard them when she was older. Note: pre-select segments, before offering to students not be accustomed to sustained, repetitive chanting type music. They may also find the storytelling style different than entertainments they know. One importance of Betty Mae’s singing is that Seminoles aren’t an unchanging people. Her songs & her entire story teach the concept of change. 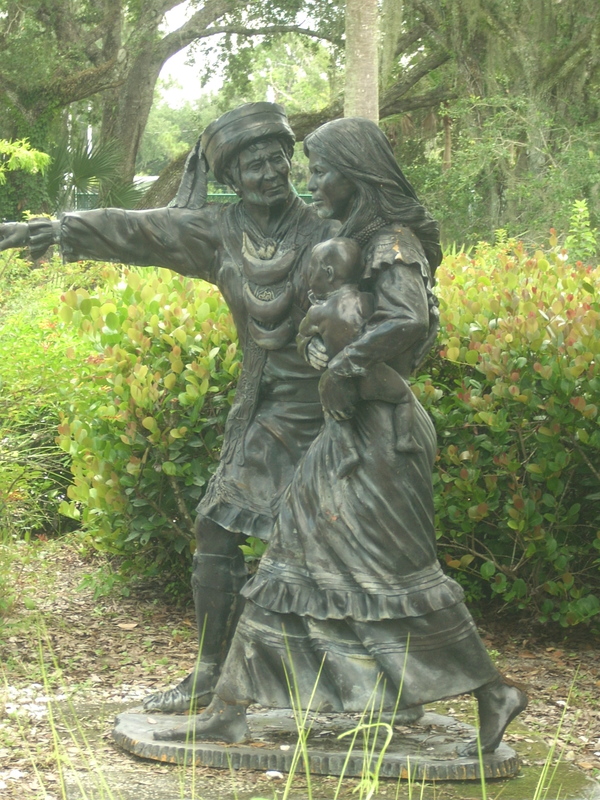 Hulpatee chobee – “BIG Alligator” in the Mikasuki language (Hitchiti) is sung by a Seminole leader who Betty Mae Tiger Jumper protected as a child. Like her, he was from a mixed-race union. The “Big Alligator” song is featured in The Florida Music Train, which was made available to many school districts from the publisher, The Florida Department of State Florida Folklife Program, 2002. It is a 100-page lesson plan/workbook & CD. Protection has brought you back. Over there to (sleep and dream) NOW THERE ARE NO GATOR LOGS !!!! emphasis can be on understanding the meaning & not on saying some concepts/words. Here are 3 concepts/words from the SHE SANG PROMISE glossary. Breathgiver In Seminole creation belief, Breathgiver, also Breathmaker, trapped animals inside Earth. The creatures burst out, because tree roots dug into the ground, providing openings. Chickee A hand-made shelter, sleeping place, or storage site. Often with a platform. It has no walls & is covered by a palmetto topped roof. Although not used for homes today, chickees are made by Seminole & Miccosukee builders, in business to provide picnic, pool, & patio shelters to Tribe members & others. Ho-La-Wa-Gus A word meaning bad luck or bad spirits; what Elders said Betty Mae was given, having been born to a white father instead of a Seminole father. 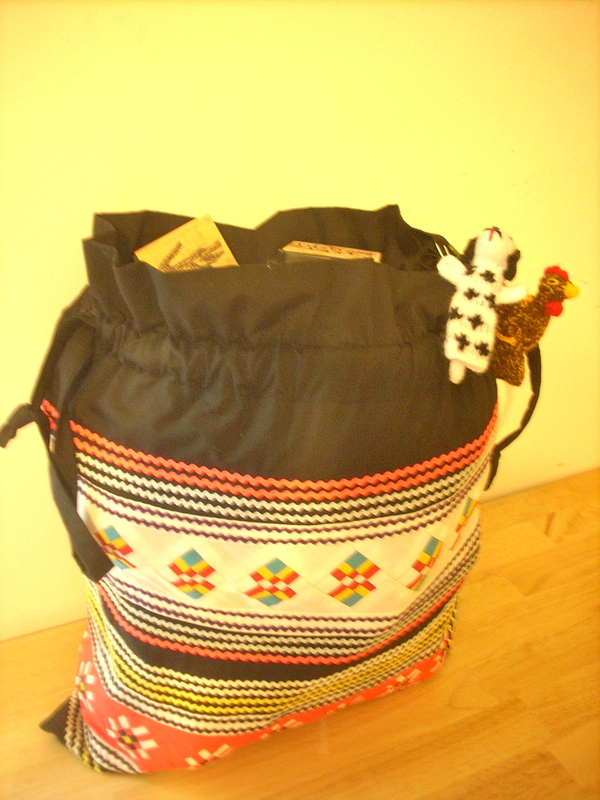 COLLECT items to put in a bag, box or other container, that can be taken out, to be prompts in talking through the story of Seminole Indians of Florida & Betty Mae Tiger Jumper. 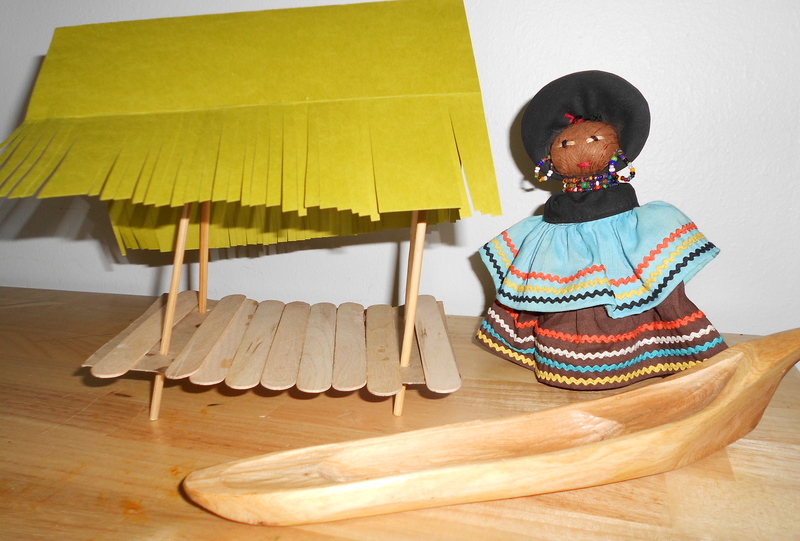 Items include: chickee model (previous); clan design (previous) clothing (shown on a postcard, or from an information brochure, or an actual item); boat image found online; doll made by Tribe member or doll image found online; flag of the Seminole tribe from image online; map of Florida with today’s reservations located on it; patchwork bookmark; poetry (previous) about Seminoles & BMTJ if you created that; portrait of Betty Mae Tiger Jumper, found online or created; BMTJ publication images – book covers.